The allure of Barcelona seems to be unassailable. Neither the terrorist attack on La Rambla last August nor the political uncertainty hovering over Catalonia seems to have diminished the international popularity of Spain’s second city, a place I fell in love with many decades ago. What thrilled me about the city then still excites me about Barcelona today: its vivacity; its stunning seaside setting; its astonishing architecture, including La Sagrada Família basilica and other intriguingly eccentric works by the Catalan architect Antoni Gaudí; its animated cafés and tapas bars; and its superb restaurants. In many ways, Barcelona just continues to get better. The city is well-advanced, with a complete renovation of all of its 39 food markets, including the dazzling Mercat de Santa Caterina and its polychrome mosaic roof; new museums have opened; and formerly shabby districts like El Raval and La Barceloneta have been restored and redesigned without losing their character. In addition, Barcelona’s food scene easily rivals — and often betters — those of London and Paris, and the shopping is first-rate. Small wonder then that the city remains in the midst of a seemingly permanent hotel boom. These new addresses offer travelers the possibility of discovering a different neighborhood each time they visit. In the past, most of the city’s best hotels were found along La Rambla and the Passeig de Gràcias. Now there are distinctive small properties scattered across the city. 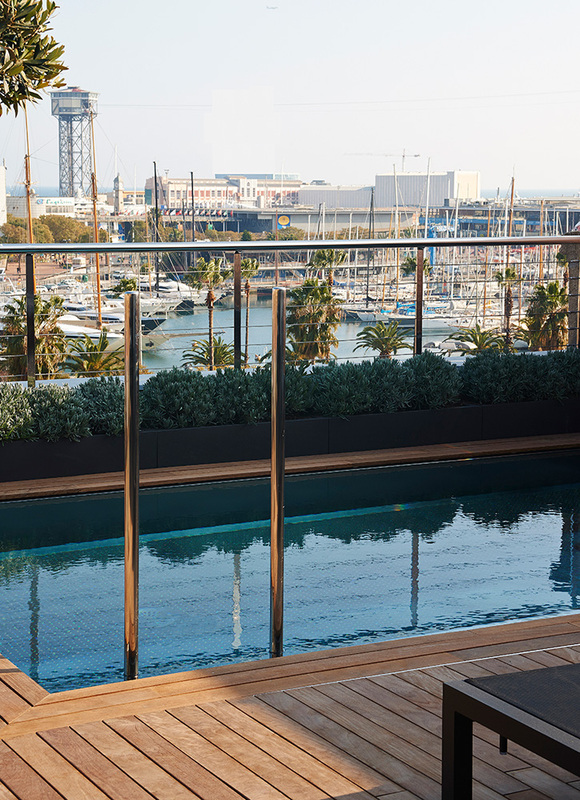 These include the 28-room The Serras, which occupies a handsomely renovated stone building on the Passeig de Colom, a street overlooking Port Vell (Old Harbor). On arrival, at 11 a.m., we were welcomed with glasses of Cava and the good news that our room would be ready within an hour. The duty manager then offered to show us around, explaining that The Serras had been designed by Francesc Daniel Molina, the Catalan architect behind the Plaça Reial, a square in the Barri Gòtic (Gothic Quarter) famous for its restaurants, nightclubs and open-air concerts. He also told us that Picasso had once had a studio in the building, where he painted “Science and Charity” at the age of 15. I asked about the current use of the space and was told that there are plans to turn it into a suite in the near future. 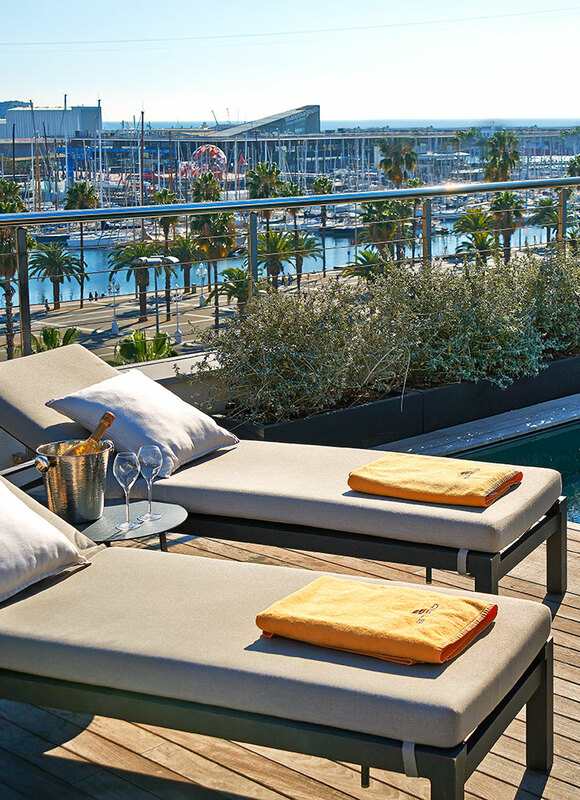 The highlight of our tour was the hotel’s rooftop terrace with its sundeck, plunge pool and cocktail bar, plus sweeping views over the shaggy-crowned palms that line the Passeig de Colom, the waterfront and the topaz-blue Mediterranean beyond. It proved a very agreeable place to relax until someone from the front desk came to fetch us. 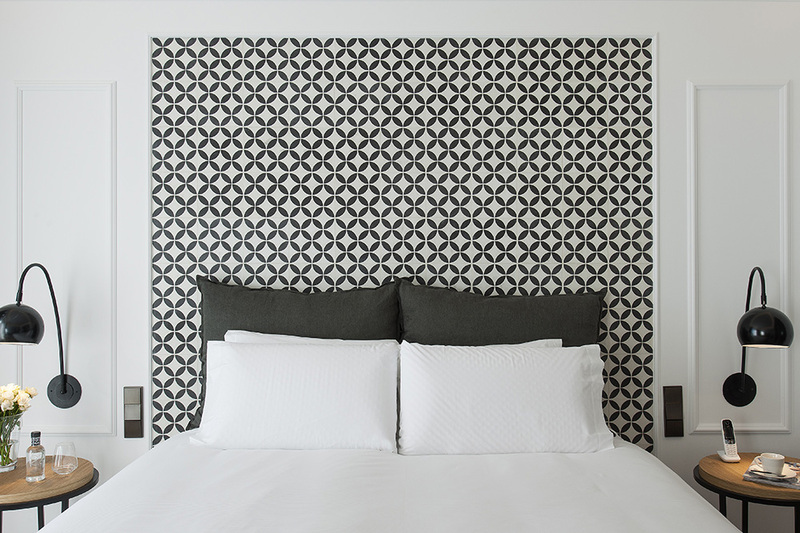 The main decorative features of the room were an exceptionally comfortable British-made bed by Hypnos, an oversize headboard covered by fabric that referenced the city’s Modernisme-style tile work and a blond parquet floor. On the other side of a room divider, the sitting area included a desk and a daybed. The well-lit limestone-lined bath provided double vanities, a whirlpool tub, a walk-in rainfall shower and Malin + Goetz products. The Serras has an excellent location on the edge of the Barri Gòtic and the lively Born district and is just a short walk from La Rambla and La Barceloneta, the old fishermen’s quarter, which is the perfect spot for a lunch of paella or fideuà (a seafood dish made with noodles instead of rice). El Born is a terrific place to shop, since it has many one-of-a-kind boutiques, including the charming Casa Gispert, one of the oldest food stores in Barcelona, and Coquette, an avant-garde fashion address for leather bags designed by Vincent du Sartel, formerly of the Spanish leatherware label LOEWE. That night, we had an excellent meal at Informal, the pleasantly relaxed house restaurant, where Marc Gascons, who has a Michelin star at Tinars, his family restaurant near Girona, is the chef. Gascons’ dishes are mostly modern Catalan and include a carpaccio of scallops with tomato, avocado and seaweed, a starter, and mains like cannelloni stuffed with chicken and a truffled béchamel sauce, or grilled shrimp from Palamós (a port northeast of Barcelona), which are a prized local delicacy. The service is friendly and alert, and the wine list is excellent too, with three white Priorats from different producers. After dinner, we enjoyed a brandy in Le Nine, the mezzanine cocktail bar, which is open 24 hours a day and draws an interesting crowd. After two very pleasant nights at The Serras, we moved uptown to the 83-room Cotton House Hotel. 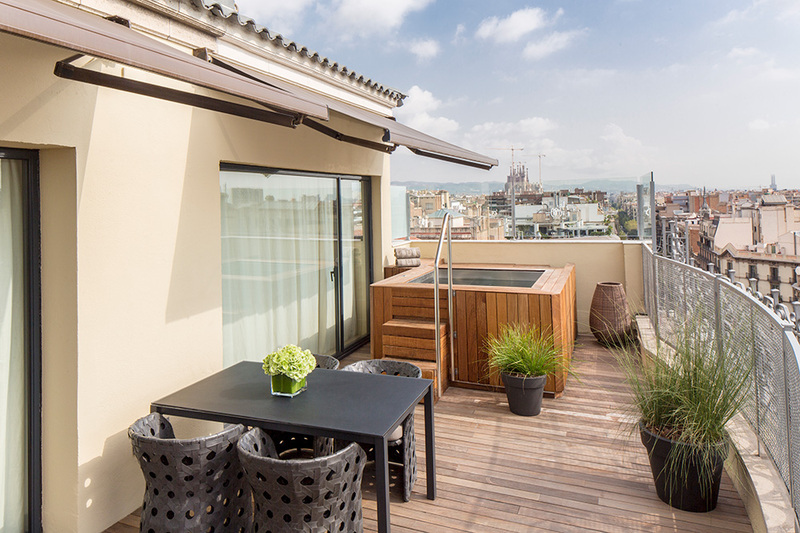 This property opened three years ago and is housed within the elegant 19th-century former headquarters of the Cotton Producers Guild, a trade association that dated to the days when Barcelona was a major textile-manufacturing center. We knew that it would be too early for our room to be ready, but we stopped by the hotel to leave our bags before heading off for the day. This proved to be a far more complicated process than I ever would have anticipated: The porter wasn’t sure he could take our bags if we hadn’t checked in, while the receptionist insisted we couldn’t check in until later in the day after our room had been cleaned. I was at a loss, not knowing the Catalan for “catch-22,” until someone suggested that a copy of my passport might enable the hotel to accept our luggage. None of this made for an ideal introduction to the property, which has been fulsomely praised by numerous major travel publications. Free of our bags, we went to visit the newly renovated Casa Vicens, a spectacular polychrome house, which, in 1883, was Antoni Gaudí’s first important commission. When it was built, the surroundings were still semirural, which is why the wealthy stockbroker Manuel Vicens i Montaner bought land there for his summer retreat. Aside from the superb architecture, artwork and tiles, the audio-visual presentation was unusually fascinating. 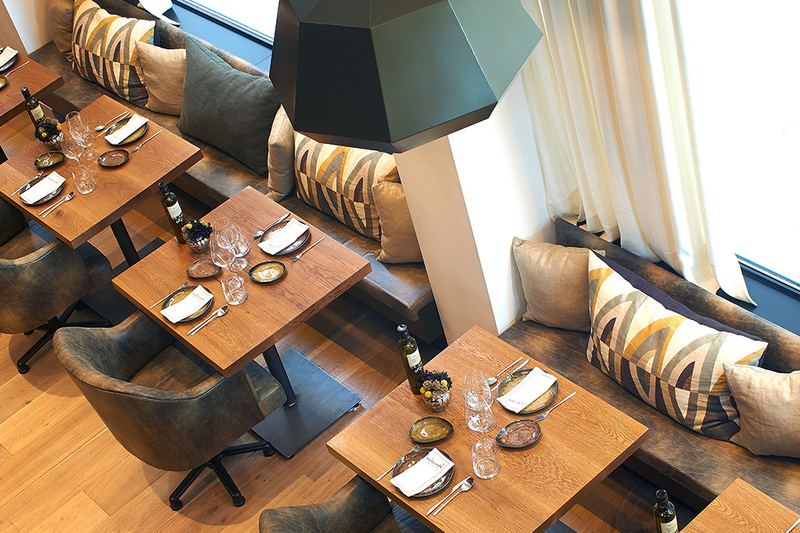 After an excellent lunch at alkimia, chef Jordi Vilà’s contemporary Catalan restaurant, we returned to the Cotton House at around 3 p.m., checked in and then waited an hour for our bags to arrive. Fortunately, our spacious duplex Vichy Suite — all the rooms here are named after cotton fabrics or places known as centers of cotton production — was charming, with a color scheme of white, sand and sepia, plus dark faux-parquet floors and a large bed with a chinoiserie headboard. The suite had two separate entrances — one on the fifth floor, where the main sitting room, bedroom and principal bath were located, and another on the sixth floor, where there was a second sitting room and a private terrace with a built-in couch, a table and chairs, plants and an outdoor shower. The two floors were connected by a circular staircase. The well-lit main bath came with a separate tub and shower, piles of fluffy white towels and Sicilian-made Ortigia amenities. Despite these being attractive and comfortable quarters, we soon noticed that housekeeping had not been very thorough. There were crumbs on the couch, plus an unemptied wastebasket. The room was also very worn for such a new property, with numerous scratches and nicks. It’s not seriously tempting in a city with such an abundance of superb restaurants. Downstairs, interior designer Lázaro Rosa-Violán’s public rooms are magnificent, including a wood-paneled, book-lined library with leather furniture and L’Atelier, the former office for members of the city’s cotton guild, which now houses the bespoke services of the chic Barcelona tailor Santa Eulalia. 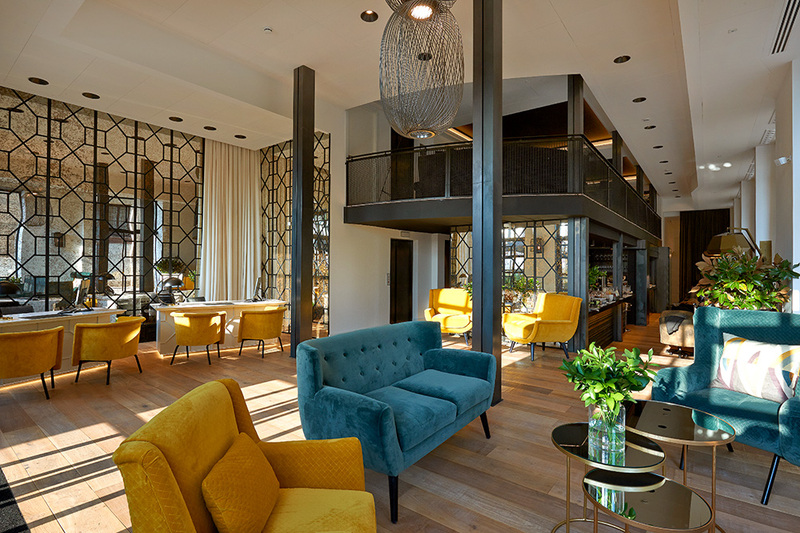 The hotel’s spacious bar overlooks a large terrace. Rosa-Violán’s vibe here is lush and nostalgic for the glory days of Barcelona’s textile industry, with various cotton fabrics worked into the decorative scheme. The hotel’s single restaurant, Batuar, serves nonstop from 7 a.m. to midnight. Although the food is pleasant enough, with dishes like potatoes with green mojo sauce and mango aioli, and duck breast with mole poblano and finger lime pearls, it’s not seriously tempting in a city with such an abundance of superb restaurants. The Cotton House also has a small outdoor rooftop pool, and treatments are available at the Mayan Spa. The young and carefully cast staff primarily wear custom-made ivory dresses and suits and are generally eager to please. That said, it took 45 minutes and constant prompting before we could get someone to take our drinks order before going out for dinner. The Cotton House is a handsome property with many appealing features, but it would benefit from better-trained staff and a hands-on management style. Beautiful public rooms with a strong sense of history. Service was frequently unprofessional; sloppy housekeeping. Book a room on an upper floor, because the Gran Via is one of the busiest streets in Barcelona. 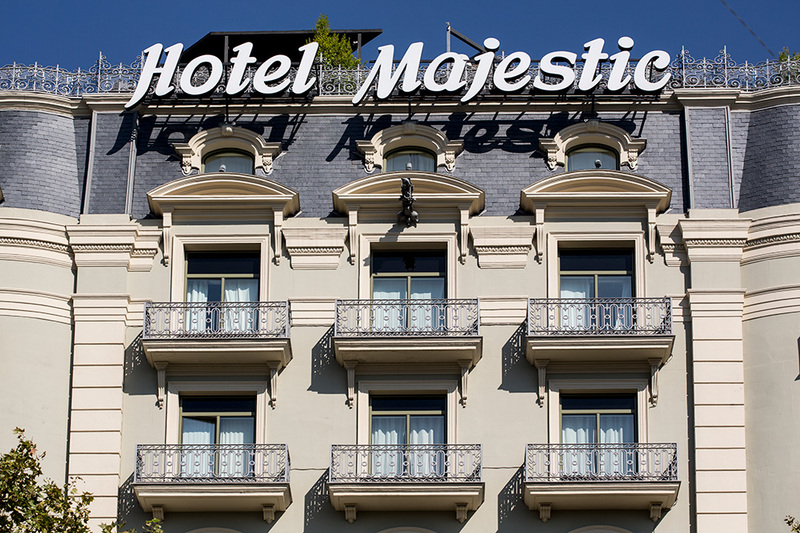 Overall, we were not entirely sorry to move to the 275-room Majestic Hotel & Spa. This stately limestone property was built on the Passeig de Gràcia in 1918 and fully renovated five years ago. It is owned by the Soldevila-Casals family, which gives it an aura of gracious and personal hospitality. Indeed, on arrival, the staff were so charming and welcoming we were quite taken aback. But we happily accepted a welcome flute of Cava while the concierge inquired solicitously if we needed any advice or help during our stay. Having heard wonderful things about chef Nandu Jubany’s cooking at the hotel’s Petit Comitè restaurant, one of the property’s five bars and restaurants, we asked for a reservation that night. We then set off for a museum morning in the Parc de Montjuïc, which has spectacular views over Barcelona and the Mediterranean, as well as being the location of the Fundació Joan Miró and the Museu Nacional d’Art de Catalunya. The Miró museum occupies a spectacular white structure designed by architect Josep Lluís Sert and is one of my favorite small museums in Europe. The grand building of the Museu Nacional d’Art de Catalunya was originally constructed for the Universal Exposition of 1929 and became a museum in 1934. Aside from a rich collection of Catalan art, it also has canvases by El Greco and Diego Velázquez. Following an excellent lunch at Estimar, the new seafood restaurant of chef Rafa Zafra, we returned to the Majestic, looking forward to a lazy afternoon. 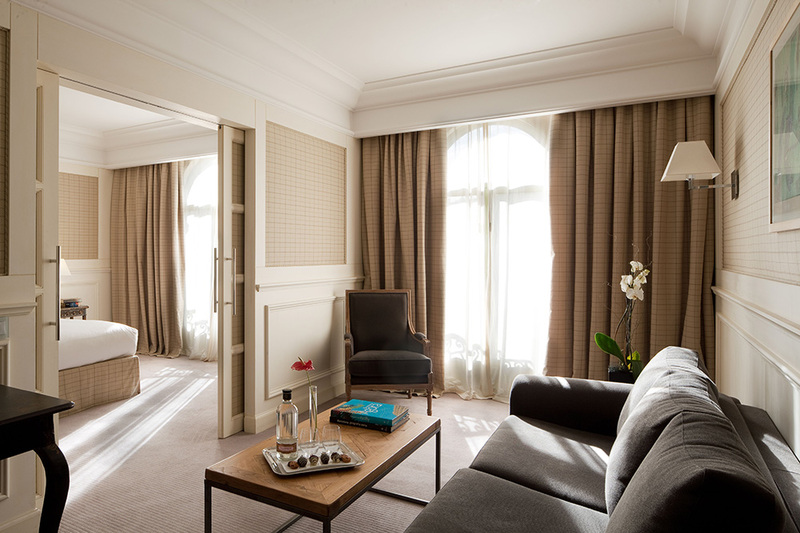 Our elegant but cozy Junior Suite overlooking the Passeig de Gràcia provided an ideal setting in which to relax. The sitting room was light and airy, with a large sofa, fitted dove-gray carpeting, an iron-framed oak coffee table, a desk and a wing chair. Pocket doors separated the salon and the bedroom, the latter having good bedside lighting, plus a Juliet balcony. The spacious white marble-faced bath came with a separate tub and shower and products from the Parisian company Atelier Cologne. Although owned by the hotel, the Michelin-recommended Petit Comitè is located five minutes away on the Passatge de la Concepció, a lively pedestrian lane filled with restaurants. There we enjoyed one of the best meals I’ve ever eaten in Barcelona, a feast of contemporary Catalan cuisine that began with tapas — ham croquettes, baby red shrimp with sea salt, and fried baby squid — and continued with marinated tuna salad with grilled vegetables and pine nuts, artichoke with foie gras and crispy Iberian ham, rice with clams, monkfish and squid, and baked monkfish with potatoes, ham and fried garlic. The Majestic’s gastronomic excellence extends to an outstanding breakfast buffet containing a huge variety of Spanish cheeses, charcuterie, tortillas and pastries. Room service was also exceptional. Facilities at the hotel include a rooftop pool and an exceptional spa and fitness center. More than anything else, what we most enjoyed about the Majestic was its remarkable level of service. The housekeeping was impeccable, the front-desk staff were unfailingly solicitous and the bar and dining room staff were cordial and efficient. We left with real regret. 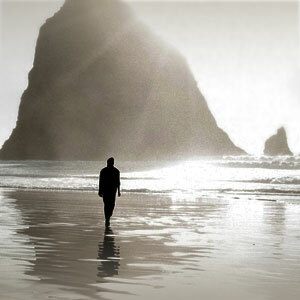 Excellent location; gracious atmosphere; outstanding personal service. As good as it is, the breakfast buffet is very expensive. The Majestic offers an array of unique guided experiences that will take you off the beaten track. Among them is a visit to Barcelona’s fish market with a marine biologist, followed by tapas and then dinner of a fish that was purchased that afternoon. Another includes a sailboat tour of the harbor.